If your home is more than 30 years old, chances are it might lose as much as 25% of its heat through the suspended floor. Traditional floor insulation methods are not really viable: they take many weeks, cost huge amounts of money and are highly disruptive. 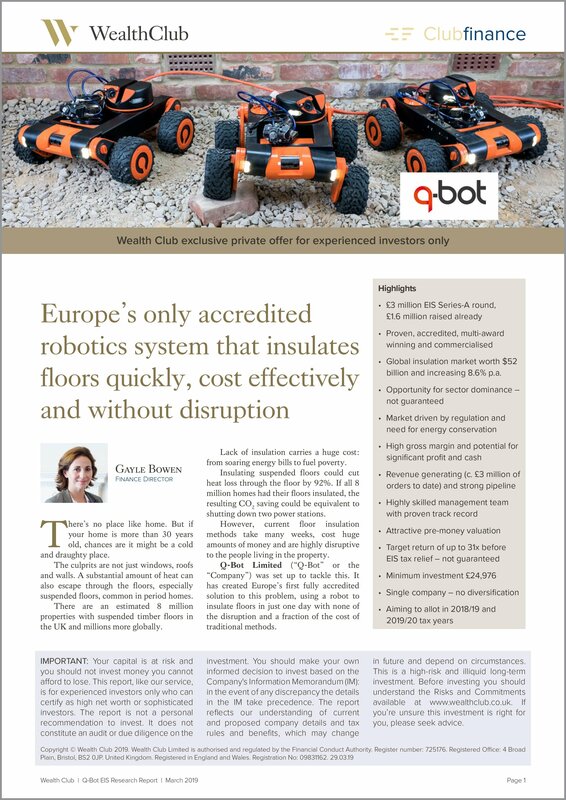 Q-Bot has developed Europe’s only accredited robotics system that insulates floors quickly, cost effectively and without disruption. The technology is already commercialised (£3 million sales to date). Now Q-Bot is raising £3 million to exploit its growth potential. Global insulation market worth $52 billion and increasing 8.6% p.a. There are an estimated 8 million period properties with suspended timber floors in the UK and millions more globally. Lack of insulation means these homes could be losing up to 25% heat through the floor. The cost is huge: from soaring energy bills to fuel poverty. Insulating suspended floors could cut heat loss through the floor by 92%. If all 8 million homes had their floors insulated, the resulting CO2 saving could be equivalent to shutting down two power stations. However, current floor insulation methods take many weeks, cost huge amounts of money and are highly disruptive to the people living in the property. Q-Bot Limited (“Q-Bot” or the "Company") was set up in 2012 to tackle this. It has created Europe’s first fully accredited solution to this problem, using a robot to insulate floors in just one day with none of the disruption and a fraction of the cost of traditional methods. There’s no need to remove the existing floor: the robot can be inserted into the most hard-to-reach places through an air vent or a pulled-up corner of carpet to access the floorboards. Once inserted, it’s driven in the void between the floor and the ground and accurately applies spray foam insulation to the underside of the floor. The robot is powerful yet compact, with intelligent control systems that can carry out complex procedures in difficult environments. Q-Bot’s solution is the only fully accredited system in Europe that does not require the full floor to be lifted, representing a huge opportunity for this early mover to become the market leader. The technology is proven and is being commercialised. With sales to date of £3 million, Q-Bot is already used by many local councils and housing associations, has a signed partnership agreement with a global construction company and has provisionally agreed terms with one of the big six energy suppliers. 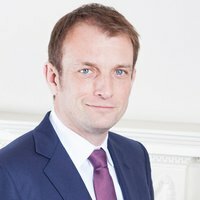 The Company plans to rapidly scale, aiming to take annual sales to over £76 million by 2024 – this is a target and not guaranteed. Now Q-Bot is raising £3 million under EIS to fund its planned growth. £970k of this has already been secured from private investors. In addition, Foundamental, a venture capital firm with a focus on investing in high-tech companies innovating the construction industry, has provisionally agreed to invest a further £650k. The balance of approximately £1.4 million is exclusively available to Wealth Club investors in this private offer. In our view, this is a commercially compelling investment opportunity with global potential. It could also deliver significant benefits – not just to investors, but also to society and the environment. Video produced and published by Q-Bot on 17 Mar 2016, in conjunction with Camden Council, the residents of Carol Street and Langbourne Mansions and Life Size Media. Multi-award winning Q-Bot is the brainchild of successful green-tech entrepreneur Tom Lipinski, high-tech entrepreneur Mathew Holloway, and Professor Peter Childs, Head of the Dyson School of Design Engineering and the Professorial Lead in Engineering Design at Imperial College London. The three founders share a vision that technology and robotics can transform the built environment and Q-Bot can become a global leader in construction innovation. All three are still involved in the business: Mr Holloway as CEO and Mr Lipinsky and Prof Childs as non-executive directors. Q-Bot now employs 31 people. EMV Capital Ltd ("EMV") advises Q-Bot on positioning itself for the most successful exit and driving shareholder value. EMV is a London-based investor focussed on B2B companies in industrial high-tech sectors. The Company is targeting midpoint net returns of 24x in year 5 before EIS tax relief, not guaranteed. The management team intends to stay in the business for the mid to long term in order to fulfil its growth ambitions. An exit might be considered after year 5. An IPO, trade sale or sale to a large private equity house are some of the options, but timeframes and exits are not guaranteed: this is a long term and illiquid investment. The valuation multiple of 16.2x is based on what high-tech quoted companies in the US focusing on the construction/engineering sectors are currently achieving. In our view, if the Company achieves its forecasts this multiple is not unrealistic, although there are no guarantees. There is no direct fee charged to the investor. Q-Bot will pay a fee of 3.75% of the funds raised to Wealth Club. Q-Bot will also pay a fee of 2.25% to EMV. Q-Bot pays EMV ongoing director fees. On exit, EMV is entitled to a performance fee predicated on investors achieving an exit greater than 1.1x. EMV will charge investors a 20% performance fee on investor profit over this hurdle. EMV will pay Wealth Club 15% of this fee, which equates to an overall 3% performance fee. Q-Bot has achieved a huge amount since it was founded seven years ago, which is testament to the highly skilled and dedicated management team, in our view. It has developed leading-edge robotics, secured the accreditations and acquired large paying customers. It is currently the only affordable and scalable solution for underfloor insulation, so the Company appears to be in a very exciting position. Whilst entrepreneurial, the Company has robust corporate governance in place and receives ongoing advice from EMV on how to drive shareholder value. Securing investment from a fund that knows the sector inside out after extensive due diligence validates in our view the valuation and growth prospects. The partnership with Saint-Gobain has the potential to be a game changer, enabling the Company to achieve rapid growth throughout Europe and securing sector dominance. However, experienced investors should form their own view. We are encouraged by the strength of the current order book which means the Company has secured half of next year’s budget already. We consider this an exciting, although high-risk, EIS opportunity with potential for attractive returns at the same time as having a positive impact on society and the environment. Read more about this offer, including the risks and download all the offer documents. You can apply online in minutes.